Amela Imamovic works at the Olovo mine in Bosnia as chemical engineer. She was able to come to the UK within the EU funded Horizon 2020 research and innovation programme of which Mineco is a leading partner. 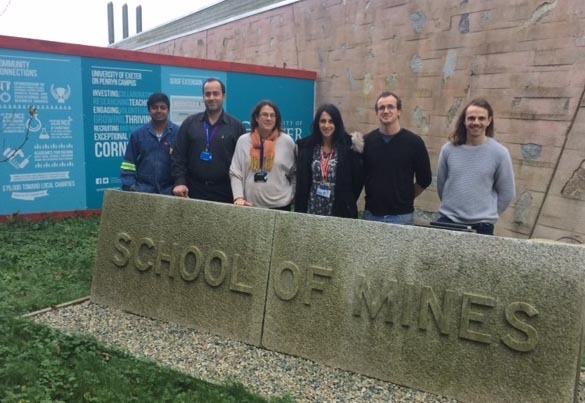 She received training in specialised geochemical procedures and metallurgical test work from the experts of Camborne School of Mines in Cornwall. The first weeks of her stay have gone by quickly, but she has written about them here: LINK. In my last two weeks at the Camborne School of Mines in Cornwall, I started to conduct jig testworks with Saeid Moradi and Luke Palmer. This is my first experience of jigs, which is a machine used for the gravity separation of ore. Water is pulsated through the material in the jig box causing settling of the heavier (ore) particles which form a bed.I spent a few days working on jig tests and after I took the samples from the first jig test and prepared them for assaying on XRF. After crushing and grinding the samples, Malcolm Spence from the CSM Chemical, imaging and mineralogical facility (CIMF) showed me how to prepare pressed pellets. Once all samples had been pressed into pellets, they were placed into the XRF overnight for analysis. The next day, Malcolm showed me how he interpreted the results on one sample and I performed the interpretation on the rest. The highest grade was found in the last sample which is the lowest layer in the jig box which proves that our testwork was successful. In these two weeks I also learnt how to do heavy liquid separation (HLS) from Robert Fitzpatrick. I used sample of vein 5 and Sodium polytungstate as a dense medium. I used different density of liquids at different stages. I was also instructed in the operation of another gravity method, the Mozley Table by Luke Palmer using samples I had previously prepared.During this time CSM was visited by Nashlen Odiar from Rados who trained all of us in the use of the XRF ore sorter which had recently arrived at CSM. Also, in my last week, Dr Gavyn Rollinson gave me a basic introduction in QEMSCAN. I have learnt many new things and worked hard during these weeks and I can say that I have really enjoyed my visit to Cornwall and CSM. The knowledge and skills I have gained mean that I am confident in performing testwork in many gravity separation methods by myself and I hope that I will have the opportunity to do this in the future in my company.